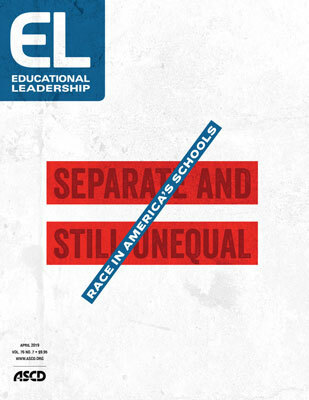 This special issue of Educational Leadership looks at the topic of race and schools in the context of the 65th anniversary of the U.S. Supreme Court's landmark Brown v. Board of Education decision, which was handed down on May 17, 1954. As such, it is somewhat different in scope and substance than most EL issues. It offers more in the way of social-historical perspective, for example, and it may be more ideologically challenging and searching. The articles take a hard look, from different viewpoints, at the persistence of racial inequities—and racism—in our education system, despite the Supreme Court's mid-20th century directive to put an end to school segregation "with all deliberate speed." If this issue has a slightly different feel, however, its focus on civil rights and diversity is entirely in keeping with ASCD's mission and history. Way back in 1955, the budding membership organization passed a resolution in full support of the Brown decision, calling for public schools to be "open and free to the children of all people … to develop to their furthest potential." In subsequent years, the association approved several additional resolutions recognizing and encouraging equity and cultural diversity as central goals of education. More recently, our Whole Child framework has called attention to the need for comprehensive and enriching supports for all children. ASCD also has a long-standing commitment to raising awareness of the social issues that affect education. "In order to grow as educators, we need to understand the full context of the history of the profession that we love and serve," says Ronn Nozoe, ASCD's recently named interim executive director. "Part of that is understanding the historical roots of why education law is essentially civil rights law." Nozoe got his start in education as a language arts teacher in Hawaii and later became the state's deputy superintendent. Hawaii has not been immune from racial equity issues, with students from native Hawaiian cultures often facing systemic challenges and performing worse than their non-native peers on a wide variety of academic and well-being measures. Nozoe says that one thing he learned in working to address this issue as a state official was the importance of dropping his preconceived opinions and solutions—which he describes, in the Hawaiian cultural paradigm, as coming from a "Western" framework—and trying to better understand the perspectives and concerns of those affected. This helped him and his colleagues work with parents and community groups to create programs that addressed their specific needs and incorporated their vision of education. The lesson was reinforced for him, Nozoe says, when he became a deputy assistant secretary at the U.S. Department of Education during the Obama Administration and began to get a deeper grasp of the racial divisions afflicting American education as a whole. Education leaders "have to do a better job of understanding the limitations of our inherited and learned perspectives," he says. "We have to step back and create time and space and venues for open dialogue and multiple viewpoints." That's also a helpful way of thinking about this issue of EL. Through experience and reflection, the contributors are all deeply versed in educational equity and diversity issues—indeed, many of them are major voices in the field. Their articles include moments of pain and frustration, and they offer ideas and arguments that challenge accepted practices and ways of thinking about education and race—as well as call attention to our roles as educators and parents in "masking" and perpetuating inequities and divisions. But in helping us re-examine assumptions, ask tough questions, and acknowledge deep-rooted issues, they also offer inspiration and pathways to fulfilling the promise of Brown. And that's ultimately what ASCD, as a mission-drive organization, hopes to encourage. "We have to continue to put this issue [of school segregation] front and center and bring visibility to it as an issue of social consciousness," says Nozoe. "We have to make people see that the system may be OK for your kid or kids in your school, but is it OK for everybody's kid?" ➛ Do you agree that racial isolation in schools poses a "major threat to the cohesiveness and stability of American society"? If so, why do you think it has been allowed to persist? ➛ What strikes you most about Noguera's experiences as a student in integrated schools? How could schools today address the types of difficulties he faced? ➛ How could educators and education leaders demonstrate greater will in pushing for school integration? ➛ Can you recall a time you observed yourself or witnessed a colleague treating an African American girl as more "adult-like" than her peers? What impact did this have on the child? ➛ Which policies and practices could be contributing to the adultification of black girls in your school? ➛ What steps can you and your colleagues take to better understand and mitigate this phenomenon? ➛ Do you agree with Kay's assertion that race conversations in the classroom are often reduced to "a moment's theater"? Why or why not? ➛ What "careful, deliberate" steps could you take to dismantle the racial status quo in your school or classroom? ➛ If a student were to ask, "Are you racist?" how would you respond? ➛ Do you think your school or district engages in any equity detours? How might you reexamine such initiatives in light of Gorski's equity literacy principles? ➛ Do you agree with Gorski's point that schools "must prioritize equity over the comfort of reluctant educators"? What would this mean in your school or district? ➛ Do you agree with Aguilar's point that because a school's leadership team is its "nucleus," its interactions "are often a microcosm for what happens elsewhere" in the building, in terms of bias being recognized and addressed? ➛ What techniques—such as taking a deep breath or "pushing pause"—have you tried during tense interactions with a student or colleague? Could you use that pause to test internally whether bias is coming up? ➛ What do you think an "equity audit" would reveal in your school? ➛ Does your school include racial breakdowns when assessing data? Why or why not? ➛ Are there places in your teaching or leading where you could be more aware of possible racial equity issues? ➛ Did you find the authors' recommendations helpful? What would you add as a step that leaders can take to bring considerations of race into their data-use practices?